Hello??? You Dont Reply ME? Sorry, I didn't mean to be rude, but as I already said, I don't want to take extra developers in this game, and I don't have the time to start making another game. After you get some experience in gamedev, you will see too that collaboration is not always as helpful as it sounds. You can't just accept any help offered to you, it may actually slow down development instead of helping it. I work for free as i have to gain more experience and may when i come on this project.May the game will be gooD!! Looking!!!!! The "gamepad config" option that is available should support any gamepad just fine, including the PS4. Did you try it and it didn't work? no i connect the gamepad and the gamepad config do the first config and then dont go,i will try to not do the config?? First of all, make sure to connect the gamepad before starting the game. Other than that, the config should work just fine. Does the config react to buttons / sticks when you press them? I am thinking of adding these too, I just need to work on some other things first! Thanks for the suggestions! I'd be happy to see it on steam but I don't want to have one more distribution platform to update when publishing updates (I already have 2, itch.io and gamejolt). However I think that Steam has its own masterservers, so I might look into it. It might be a way to create fully online matches on stick veterans. Can I work with you , I am a unity3d Developer , I have 4 years of experiencE! I like cooperating but not at this time unfortunately! Lol! I work for free!! as i have to gain experience! give me a facebook link of ur profile or anything we can talk!!!! Thanks :) all you guys who make them are to thank! Thanks for the suggestions! I have already noted down these ideas and I am considering adding them. Thank you! Hope to make it better! Sorry to hear that! Does it recognize any buttons / axes at all? Or is it completely unresponsive? Still have to wait for the new version, but it will be ready soon! Nope, sorry! It's a long list, and things on the list are not guaranteed to make it to the game. Hey junkbytes, I have a really strange idea that might work. A campaign. I think it would be fun to complete different levels and unlock new weapons on the way. Hey aj, the idea is not strange at all and it would be fun too. The problem is that it would take a lot of time and effort, and I don't know when I will be able to get it done, but it's certainly on my list of desirable additions. Did you notice this in deathmatch only or other modes too? Allow me to point out that "building AI waypoints" (a tool in the top-left dropdown menu of the editor) is required to be done so that the bots can move. This tool essentially analyzes the map so that the bots know how to traverse it, otherwise they stay still. 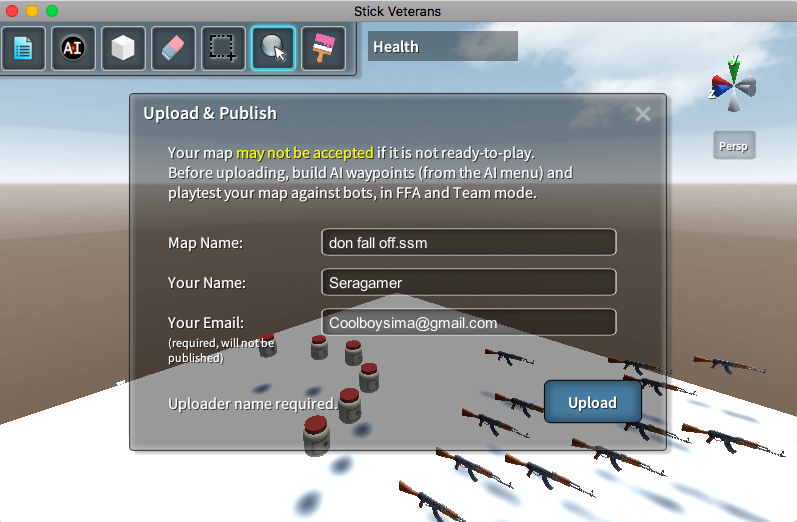 If you already did this and they still don't move, please upload the map from the "upload and publish" tool in the editor menu, so I can see what's going on. It may be a bug after all. Indeed these are two things in the game that often confuse people. Ai waypoints are a necessary procedure and can't simply be fused with the spawpoints. The name is misleading; What this procedure actually does is calculate the available paths from one point to another, for multiple points in the map. As such, it can't be removed, however I can add a message about them whenever the player tries to test the map without waypoints. The need to download the maps is not obvious either. Built-in maps are a solution I thought of, too. However I don't want people to keep playing the same maps all the time and be unaware of the new maps constantly being published. I might add an ingame message for that too. Thanks, I've thought about it too, it is among the planned features! Sounds good, I may add it if I make a "specialty kit" based mod, where you choose your weapon on respawn and can only change by stealing dead people's kits. Might be a little redundant now though, since maps are already full of weapon pickups. I've been thinking about it too but there are various problems with it. I would suggest playing on more flat maps, where more running and less jumping is involved. Somehow didn't see this comment until now. These gamemodes look pretty fun, some of them I hadn't even heard of, since I haven't played any of the new COD games. I might try to add some of them to the game. Thanks for suggesting them! Thanks for the suggestion, I've actually tried this. I eventually realized that anything more than two teams becomes too chaotic (with the game being chaotic enough as it is). Having more than two teams becomes unnecessary complexity for the players. Turns out this is why most games are two-team based. I'm eager to see it released too! Can't say for sure, as it really depends on how my free time fluctuates. If all goes well, it could be ready in a month, but please keep in mind this can vary significantly. still planning to finish it though! Good suggestions, noted for future additions! Grenades are among the first things I want to add after making multiplayer, so with some patience you will get to see them! As for pistol variations, I also think about adding them, but that might take longer to happen. It seems like you added colors, and even a CTF gamemode. feeling hyped to start making maps for it again. Glad you like the changes! More of them are underway! It would be nice if you could add the option to set the gravity/jump height of the players on any map you make, and use basic trigger blocks. Im trying to make a map where the blue side has to reach the end while the red side tries to stop them, and it would help if they didnt jump everywhere. it would also be ideal that the red spawns get closer to the blues' position (why trigger blocks are needed). I am able to do the map without these additions, but it would help! First of all, I like your concept for the map, and I appreciate the effort you put into making it. However, I am very skeptical about the features you mention. As for the trigger blocks, do you mean blocks that perform a certain action when you touch them? I'm afraid that would take a lot of work from my side, especially now that I am working on the online multiplayer. Making action blocks would be close enough to making a new Garry's Mod (I mean, it would be cool, but is far from my currently set goals). Making adjustable per-map gravity and other options has been mentioned before. So far, I avoided adding it, because it would cause uneven player experience. When you get used to a certain gravity, suddenly changing gravity throws players out of the game expertise they have gained by habit, and this frustrates them. I'm sorry for not being much help, but please undestand it's important for me to consider the work/gain ratio for any proposed features. I like your suggestions and wish I could immediately get them done. Super fun! only thing i noticed was the sniper is very hard to use and get kills with, but other than that the 2D and 3D gamemodes are very fun to play! Recommended! Weird, that's not how they are supposed to be. First, check that you are indeed in TDM. When you hold down Tab, you must see two lists of players (one for each team). If there is only one vertical list, you are not in Teams mode. If you really are in teams mode, then this is a bug. Try enabling colorblind mode in Options, this should at least change the team colors to black and white. As it seems to me, though, you are probably in FFA mode and haven't chosen Teams for some reason. It takes a lot of experience and experimentation, you only need to keep trying! Some tips are to use the copy/paste functions, the rulers (press R) and axis locks (press X, Y, or Z). so i started playing and i made this map called wooden house base, when i desided to play on it, i saw some things that i havent edited on my map and it just made the map look insane!! Secondly, yes, these edits where made by me. Specifically I added top and side windows to let more light in, as the map looked kinda dark with the current game lighting. I should have let you know about the edits before making them, sorry. Please let me know if you want me to revert the edits. dont worry, I like it and I will keep it. It makes it look much greater! 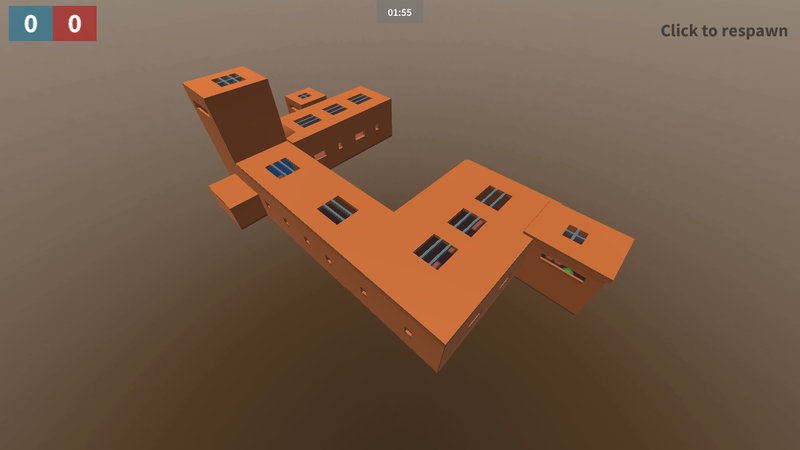 It's called "wooden house base.ssm" and it's already uploaded, you can use the search box in the maplist to find it more easily! What message does it show? It should be telling you the reason why. Also, you don't need to upload the map, a screen-capture should be just fine. That's weird, maybe it's a bug. I'll look into it as soon as possible. Hey Seragamer, I haven't been able to find any problems with the uploader. Is the upload still not working for you? That's relieving to know, thanks! I mostly agree with you on the weapon / character customization part, so I will think about it. Vehicles are also something I consider adding. In that case, I would probably add support for arbitrary terrain in the maps so that they can be vehicle-friendly. Lots of work to get it done, but will probably do it sometime. Juggernaut level also seems a good idea but I will have to think it through thoroughly. As for the CTF game, I thought the score was based on flag scores, and kills didn't count. Have you noticed something else? It may be a bug. The next update will most likely be focused on multiplayer. This means that I probably won't be working on other new features until that part is done. Weapon customization and skins are a possible addition, but they would require a lot of work, so it would take a while until we see them done. Payload mode is very unfitting for a game like this; it requires maps especially built and thought-out for this specific purpose. I don't plan on adding this feature, though I might reconsider in the future. Minigun is among the additions I intend to work on. I really love your game. Maybe you can make a online mode and do skins and things so you can put in micro transactions and make good money with it. I really like if there is coming an online mode. Glad to hear your praise and suggestions! Online mode is my main goal to achieve in this game. Not sure if I would want to add micro transactions, but I might try it and see if players are positive towards it. no problem, I am really enjoying your game.